Bring on the barbecue! 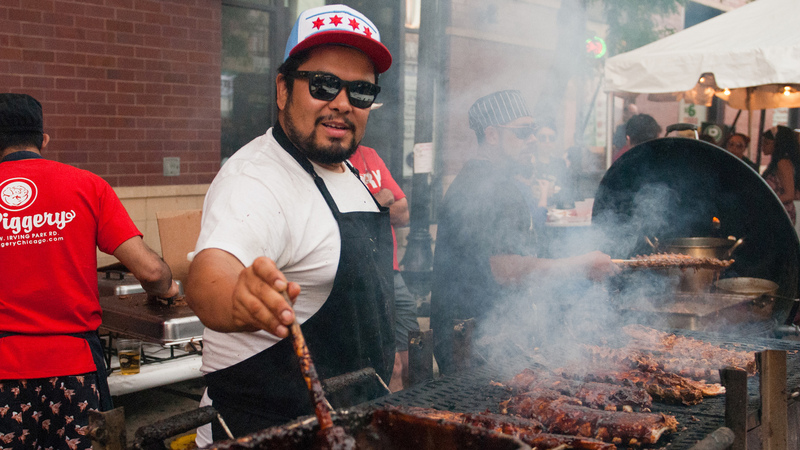 Feast on ribs from a baker’s dozen of restaurants at Ribfest Chicago. Each vendor offers a three-bone sampler, half rack or full rack. (Hungry for something else? Food vendors serve up other festival fare, like tacos, sliders and sandwiches.) Once you’ve had your finger-licking fill, be sure to vote for the “People’s Choice” award for best ribs. Two stages of live music feature, among other bands: The Weeks and Waco Brothers (Friday); Algiers and Yoke Lore (Saturday); and Ra Ra Riot and Striking Matches (Sunday). A special area for kids features live entertainment and games all weekend. More than 25 food trucks and local restaurants dish out delicacies at the Pilsen Food Truck Social. Sampler tickets ($20) include six sample-sized portions. (Don’t worry: Regular-sized food and beverages are also available for purchase.) Live music, DJs, cultural entertainment and kid-centric games fill out the fest. As blues fans mourn the loss of Eddy “The Chief” Clearwater, a gathering in Millennium Park celebrates the men and women who have made their mark on the genre. This year’s Chicago Blues Festival, billed by the city as “the largest free blues festival in the world,” features four stages of live music and celebrates the legacies of Little Walter and Bob Koester with special tribute performances (Friday and Saturday, respectively). Blues powerhouse Mavis Staples headlines the fest Sunday. New this year: outside alcohol will be prohibited. And expect increased security, including a bag check. See live demonstrations of pottery making and wheel throwing as you browse the works of 110 artists at the annual Promenade of Art. A graffiti wall, art bingo and photo booth keep the kids entertained as you shop. Details: The festival continues through Sunday at various locations in the city’s Uptown and Edgewater neigbhorhoods, including Chicago Filmmakers, 5720 N. Ridge Ave. Prices vary. Woodworkers, sculptors and painters are among the more than 220 artists whose work will be showcased at the Wells Street Art Festival. New this year: an area dedicated to “green” works from nearly two dozen artists whose creations are made from used and recycled products. Fare from neighborhood mainstays keep you satiated. Nearby, the charming Old Town Art Fair is also underway. Get details on that festival here. It may be born of the neighborhood’s Swedish heritage, but the Andersonville Midsommarfest goes beyond old-world traditions, offering five stages of live music and entertainment, more than 100 vendor booths, food and drink vendors representing the neighborhood’s international flavors, a play area for kids and more. Music highlights: 16 Candles (Friday); Mucca Pazza, The Boy Band Night, Fabitat (Saturday); and Libido Funk Circus, Catfight, Chicago Jazz Orchestra, American English (Sunday). Bonus: The Chicago Spirit Brigade performs throughout the weekend. Find your summer beach read at the 34th annual Printers Row Lit Fest. In addition to five blocks of books, the two-day fest features conversations with authors, including the National Book Award winner Joyce Carole Oates, Fredrik Backman and Chicago Cubs World Series champion David Ross. Seven of the city’s percussive dance companies take the stage when Chicago Human Rhythm Project hosts “Stomping Grounds.” On the bill: Chicago Dance Crash, Mexican Folk Dance Company of Chicago and Trinity Irish Dance Company. Move to the beats of more than 50 electronic dance music artists at Spring Awakening. Headliners include Steve Aoki (Friday), Big Gigantic (Saturday) and Deadmau5 (Sunday).